All Things Food / Bouffe 360 | Healthy, local food for all. Finance and accounting for food and agricultural businesses. 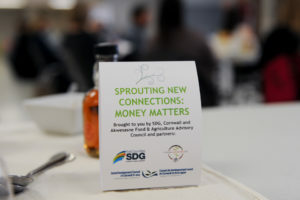 On February 1st, 2018, the SDG, Cornwall and Akwesasne Food and Agricultural Advisory Council, a new working group of All Things Food|Bouffe360°, hosted a second edition of the Sprouting New Connections speaker series. The first workshop was called Sprouting New Connections: Scaling up! which focused on small businesses looking to grow and expand. 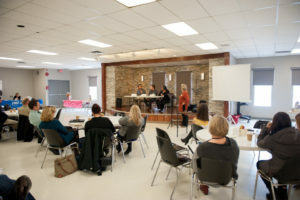 This event was hosted in close partnership with the Social Development Council of Cornwall and Area, and the United Counties of Stormont, Dundas, and Glengarry. The series concluded with an interactive Q&A panel of experts in the industry that were able to answer questions about funding and grants in this region. The day included refreshments and lunch highlighting some of our incredible local businesses and producers including Simply Baked, Coffey’s Coffee, The Quirky Carrot, Homestead Organics, Against the Grain Farms, Glengarry Fine Cheese, Fauxmagerie Zengarrry, Kirkview Farms, Upper Canada Creamery, Honey from the Glen, Wightman Sugar Bush, Just Farms, and Avonmore Berry Farm. We also had product sampling from Bonville Gardens and showcased product on display from Stonecrop Acres. Looking for more information? Explore the presentation briefs, slides, and additional resource links below. Did you attend the event? We want to hear from you! Please complete a quick, 2-minute survey, to let us know what you thought of the event. All event feedback will be considered as we work towards hosting more professional development opportunities and events to our region. Tell us what you want to see! The survey is completely anonymous. Click here to complete the survey online. 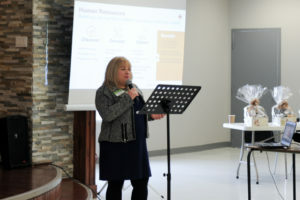 Rose D’Amato presented on behalf of the Business Development Bank of Canada (BDC) and outlined the different types of financing available for businesses while highlighting the ease of the online application process as well as the website’s online tools. The BDC looks at providing the right combination of services for each unique business. They also offer advisory services to enable small businesses to become self-efficient by teaching financial literacy skills. Doreen Ashton-Wagner owns ForLoveAndBusiness.com a community that helps female entrepreneurs learn how to be successful in business. She spoke about the differences between men and women when dealing with financial matters and highlighted the different levels of confidence and risk aversion tendencies. Doreen mentioned types of online assessment tools available that will help you get an idea of how you approach doing business. To learn more about the services Doreen offers visit ForLoveAndBusiness.com. 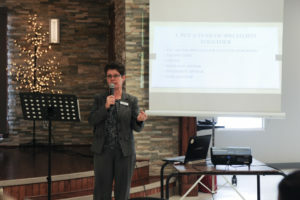 Theresa Wever offered a wealth of information in her presentation, including the importance of businesses insurance, having a short and long term financial plan, having a clear retirement strategy, and having a will. She went on to explain the differences between being a sole proprietor and a having a partnership and the factors that impact both. She outlined scenarios to highlight why having a financial plan is so important to ensure the financial safety for your family in 5, 10, 20 years from now. 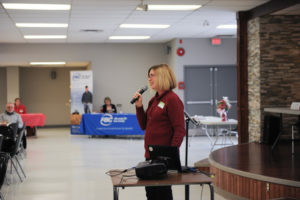 Candy Pollard spoke about the importance of having a strong business plan, the components of, tips on how to write one, and how the The Cornwall Business Enterprise Centre (CBEC) can help. CBEC provides free advisory tools for businesses in Stormont, Dundas, Glengarry, Cornwall, and Akwesasne. Discussion Highlights and Key Recommendations DOWNLOAD HERE. Local Funding for Small Businesses: Did you know? 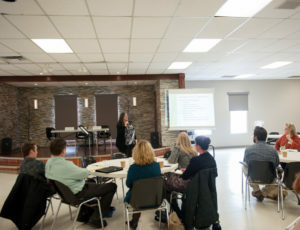 Standard Freeholder: Digging into Dollars at second Sprouting New Connections event in Alexandria. Written by Alan S. Hale, February 1, 2018. Thank you to our event sponsors and partners! Photos courtesy of Gina Dragone. All presentation materials are the property of their respective owners. Please contact info@allthingsfoodbouff360.ca to request the use of any specific content. Copyright 2017 All Things Food / Bouffe 360. All rights reserved.